On Thursday, April 29, fourth grade students went on a field trip to Sacramento. We met at Ontario Airport at 5:30 A.M. First we met our tour guide, Michelle. We got on a bus and drove to Old Town Sacramento. We saw the American River, walked around the town, and even rode on a stage coach. We also visited an old school room from the 1800's. One of the best parts was the stop at Candy Heaven, where I tried a REAL chocolate covered cricket! 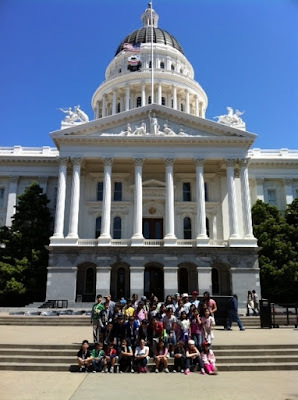 After Old Sacramento, we rode the bus to the Capitol building and toured the place where the California laws are made. Then we headed to Sutter's Fort, ate at Old Spaghetti Factory, and saw a magic show. The next day, we got back on the bus and drove to the Nimbus Fish Hatchery, where we fed the fish. Next, it was up to Coloma to pan for gold on the American River. Unfortunately, I didn't find even one flake of gold, nor silver, nor copper. So most of us just went to a gift shop and bought little bottles of gold flakes. Finally, we went back to the airport, ate a quick dinner, and boarded the plane back to Southern California. We were all met by hugs, kisses, and words of kindness from our families. Home, sweet, home! The Department of Boating and Waterways sponsors the Safe and Wise Water Ways poster contest each year, promoting safe boating and waterways rules. Eighth grader Kile Y. was one of the winners for the entire state of California, and his artwork is showcased in the organization's 2011 calendar for the month of February. To view his entry, click here. Eighth grader Kile Y. won 1st place for the second time in the 7th-9th grade category. His entry is pictured above. Kile will be recognized Friday, May 6th, at the Irvine Marriott. His art will be featured on Council on Aging note cards as well as receiving a cash prize. This local contest sponsored by Arts Orange County attracts over 500 entries each year. To be chosen as one of the 24 finalists is a very big honor. Seventh grader Katie M. was one of the 24 finalists for this contest. Her work was professionally exhibited from April 20 through May 7 at the Showcase Gallery of Orange County Fine Arts Center in South Coast Plaza Village. A reception and recognition ceremony was held on May 7 for the talented artists. Each year the Mable Campus enters artwork into the Imagination Celebration juried art show. This year the Mable Campus Junior High has three pieces of our student's art in the exhibit. A reception honoring the students will take place this Saturday, May 14th at 12:30 p.m. in the Crate and Barrel Wing of South Coast Plaza. Be sure to stop by and visit the exhibit if you are in the neighborhood.